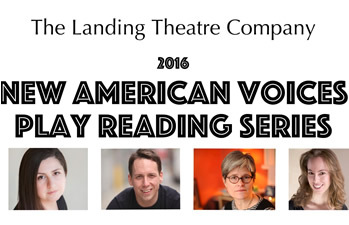 The Landing Theatre Company announces their 2016-17 Season, featuring the World Premiere of SMALL JOKES ABOUT MONSTERS, 2 Regional Premieres, and the nationally-recognized New American Voices Play Reading Series. HOUSTON - David Rainey, Executive Artistic Director of The Landing Theatre Company (LTC), announces the company's sixth season, and first full season in their new venue downtown: Landing Theatre @ the Docks (formerly home of Catastrophic Theatre and DiverseWorks). This season will feature the world premiere of Steven Strafford's Small Jokes About Monsters, a finalist in the 2016 New American Voices Play Reading Series; the Regional Premiere of Idris Goodwin and Kevin Coval's This is Modern Art, originally commissioned by Steppenwolf; the Regional Premiere of Winter Miller's In Darfur, originally co-commissioned by the Guthrie Theatre and The Playwrights Center and presented at the Public Theater; and the Olivier-nominated Jesus Hopped the 'A' Train by Pulitzer Prize winning playwright Stephen Adly Guirgis. at our new home in the Silos at Sawyer Yards! (1502 Sawyer, #232, Houston, TX 77007). We are ecstatic to be a part of the largest concentration of creative organizations in the state of Texas, within the Washington Avenue Arts District, in the Silos at Sawyer Yards! Hub Studio will host events for all of Houston, and the season is already being pre-booked. The final steps are being completed and now all we need is you to come out and enjoy the space with us! CATASTROPHIC THEATRE IS MOVING TO MATCH! The Catastrophic Theatre is pleased to announce that it will move its operations to MATCH (Midtown Arts and Theater Center Houston) in January 2016. By doing so, Catastrophic will join a broad spectrum of Houston’s arts organizations in an accessible, state-of-the-art facility that will bring together an array of artists and art lovers from across the region’s diverse cultural, economic, and geographic communities. Catastrophic’s audience will now be able to attend its productions in a prime location at 3400 Main Street @ Holman, easily reached from all areas in Houston and directly off the Metro rail line.